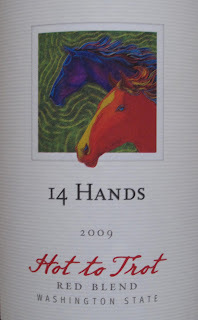 Without knowing anything about this wine, I picked it up merely on my past experience with 14 Hands Cabernet Sauvignon. Also, for the price of $8.78/bottle it wasn’t going to be something I’d expect much out of for the BBQ I was taking it to. I was wrong…it was a great, easy drinking wine! I wouldn’t label it as a “big red” but sometimes it’s nice to just have a “go to” red for everyday enjoyment. This fit that very well. The aromas brought on a strong peppery spice, yet as the wine opened up it had more of a dark stone fruit hint like plums with mocha. On the taste it was more of the plum flavors, mocha and subtle vanilla. This may be due to the neutral barrels used in aging. To help understand that, a neutral barrel is one that’s been used for apx. 5 vintages/years and therefore doesn’t exude as much of the oak flavors you would find in a new barrel. Soft tannins and a smooth mouth feel make this a wonderful wine to go with just about any pasta dish or even grilled meats. I’d probably have this for a starter red when entertaining. It’s easy drinking and smooth enough for even white wine drinkers. Moving on to a heavier red for your dinner would be my recommendation. The blend is Merlot, Cabernet Sauvignon, Syrah and Petit Verdot. I found it at Sam’s however you may find it elsewhere. I just saw this wine in the store and was wondering about it. Thanks for the post, now I feel brave enough to pick it up!